This report discusses Avachinsky in 2001-2010. Following lava flows emitted in 1991 (BGVN 16:12), Avachinsky generated near-daily fumarolic plumes and generally low (background) seismicity (figure 3). The escaping gases contained sufficient sulfur to construct an area of sulfurous deposits at a prominent NW-trending crack on the SW rim of the summit crater. In 2001 a series of minor earthquakes were sometimes accompanied by gas-and-steam plumes (some with ash) (BGVN 26:11). Weak fumarolic activity and small mudflows also were observed. Figure 3. View of Avachinsky volcano from the W on 24 March 2004. From Droznin and others (2004?). By November 2001, seismic activity had declined to background levels where it apparently remained until 2005. On 8 November 2005, the Kamchatkan Volcanic Eruption Response Team (KVERT) reported that the number and energy of shallow earthquakes below Avachinsky had increased during the previous month. A weak thermal anomaly near the volcano's summit was visible on satellite imagery on 7 November. Seismicity increased significantly on 21 November, with very shallow earthquakes and several hybrid earthquakes. A weak thermal anomaly near the summit was visible on satellite imagery during 20-21 November. During 2006 moderate fumarolic activity occurred, producing a steam plume about 700 m above crater. Seismicity was at background levels, with occasional weak seismic events at 500 m depth. On 10 May 2008, a plume from Avachinsky rose to an altitude of 4.3 km and drifted S and E. KVERT did not detect ash by direct observation or on satellite imagery. Cross-sectional view. A topographical profile of the volcano (figure 4) shows the inferred geothermal reservoir. The possible drill hole (dark line) and plant are only in proposal stages. Figure 4. Inferred boundaries of geothermal reservoirs (dashed line) in vertical cross-sections of the Avachinsky volcano. Circles depict earthquake hypocenters associated with a steam eruption in 2001 (data from four stations, Kamchatka EMSD GS RAS). From Droznin and others (2004?). Droznin and others (2004?) note that "The heat discharge of the fumaroles may be estimated based on the geometrical characteristics of their clouds, taking into account local meteorological conditions.... 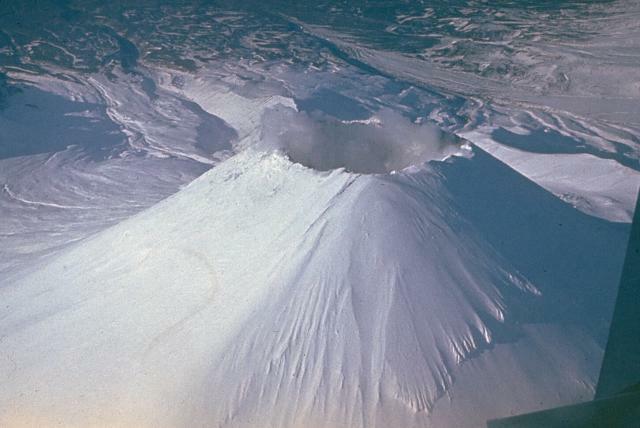 The Avachinsky volcano fumaroles have been monitored since 2003 for the purpose of using the size of the fumaroles clouds to estimate the corresponding heat discharge. Its worth noting, that the real size of the thermo-clouds may be estimated only when there is 100% air saturation. "The October 2001 eruption revealed an active steam-dominated reservoir below the lava plug of 1991. The swarm of the earthquakes hypocenters synchronized with the eruption 2001, showing the true geometrical size of the steam-dominated reservoir [figure 4]. This 1-km radius reservoir extends from the elevation of the lava plug at 2,750 m a.s.l. to -1,000 m a.s.l., where some north east trend shifting of the reservoir occurs. Similar earthquake distributions were detected in 2004." Reference. Droznin, V.A., Dubrovskaya, I.K., Kiryukhin, A.V., Chernykh, E.V., Senyukov, S.L., and Ivanysko G.O., 2004(? ), Avachinsky volcano geothermal reservoir based on fumaroles activity and seismological network data; (undated) Report of the Institute of Volcanology FEB RAS, Piip-9, Petropavlovsk-Kamchatsky, Russia, 683006. Information Contacts: Kamchatka Volcanic Eruptions Response Team (KVERT), Far East Division, Russian Academy of Sciences, 9 Piip Blvd., Petropavlovsk-Kamchatsky, 683006, Russia (URL: http://www.kscnet.ru/ivs/); Tokyo Volcanic Ash Advisory Centre, Tokyo, Japan (URL: http://ds.data.jma.go.jp/svd/vaac/data/); Kamchatkan Experimental and Methodical Seismological Department (KEMSD), Geophysical service, Russian Academy of Science (URL: http://www.emsd.iks.ru/index-e.php). Seismic activity at Avachinsky began to increase significantly on 21 November, with very shallow earthquakes and several hybrid earthquakes recorded at the volcano during 0800-2400. A weak thermal anomaly near the volcano's summit was visible on satellite imagery during 20-21 November. KVERT reported that based on these changes, the possibility of sudden ash explosions had increased. The Concern Color Code remained at Yellow as it has since 8 November. KVERT reported on 8 November that the number and energy of shallow earthquakes below Avachinsky increased during the previous month. A weak thermal anomaly near the volcano's summit was visible on satellite imagery on 7 November. KVERT reported that based on these changes the possibility of sudden ash explosions at Avachinsky had increased, so the Concern Color Code was raised from Green to Yellow on 8 November. During 26 October to 2 November seismicity was at background levels, with only weak earthquakes detected (magnitudes less than or equal to 1.2). During 29 October to 1 November, when the volcano was visible, weak-to-powerful gas-and-steam emissions were observed extending to the SE and E. The Concern Color Code was reduced from Yellow to Green. During 19-26 October several gas-and-steam plumes rose above Avachinsky's crater, with the highest plume reaching 1 km and extending 20 km to the SE on 20 October. Seismic activity continued above background levels; ten earthquakes occurred with magnitudes of 1.3-2.1. The volcano remained at Concern Color Code Yellow. During 12-19 October gas-and-steam plumes rose above Avachinsky's crater and until 18 October seismicity was at background levels or was not registered. During 18 and 19 October a series of weak local earthquakes were detected ~700 m beneath the summit. On 17 October a fracture was observed in the lava dome that extended E-SE and W-NW, joining the hottest parts of the edifice. The fracture extended 100-150 m down the flanks of the cone.The volcano remained at Concern Color Code Yellow. Intense gas-and-steam plumes rose above the volcano several times during 6-11 October, with the highest plume climbing 500 m. During the report period, weak fumarolic activity occurred and seismicity was at background levels. Satellite imagery on 2 October showed a broad band of warm ground that appeared to follow the rim of the crater, with a small area of warm ground in the center of the crater. The volcano remained at Concern Color Code Yellow. During 25 August until at least 5 October several earthquakes, with magnitudes between 1.2 and 2.5, were detected near Avachinsky. On 5 October at 0759 an earthquake inside the volcano's edifice was accompanied by a small gas-and-steam explosion with small amounts of ash that rose less than 1 km above the crater. A thin layer of ash covered the SE sector of the volcano's edifice. The same day at 1000 larger gas-and-steam plumes were observed rising above the volcano. Mudflows traveled 50-100 m down Avachinsky's SE slope. KVERT personnel believe the mudflows were caused by intensive activity at a single fumarole on the SE side of the summit. On 5 October the Concern Color Code at Avachinsky was raised from Green to Yellow. An eruption began on 13 January with explosions at 1158 and 1203 that ejected ash clouds to 4-5 km above the crater. Ash fell on Petropavlovsk, roughly 30 km SSW. Lava was observed in the crater and small mudflows moved down the flanks. No pre-eruption seismicity was recorded, but seismic activity associated with the eruption was increasing as of 17 January. Information Contacts: B. Ivanov, IV. The following supplements the preliminary report in 15:12. The eruption lasted until 30 January 1991, filling the summit crater (400-500 m in diameter) with ~21 x 106 metric tons of lava (figure 1). Circumferential and radial fissures 6 m deep covered the surface of the lava dome. Lava overflowed the S rim, feeding a flow that advanced 1.5 km down the SSE flank and short flows on the SW flank. Numerous fumaroles developed around the dome's margins. Figure 1. 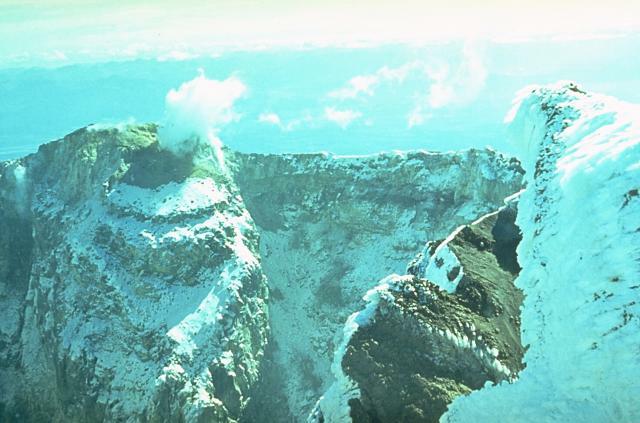 View looking NW at the summit of Avachinsky, 11 October 1991. The summit crater (400-500 m in diameter) is filled with lava from the January 1991 eruption. Small lava flows at right extend down the SW flank. Photo taken by A. Ovsyannikov. Fumarolic activity was occurring from numerous points around the margins of the January 1991 lava dome during a 13 May overflight. Numerous circumferential and radial fissures, previously observed in October 1991, covered the dome's surface, but the small lava flows that extended down the SSE and SW flanks were no longer visible. Information Contacts: H. Gaudru, SVE, Switzerland; G. de St. Cyr, T. de St. Cyr, and I. de St. Cyr, Lyon, France; T. Vaudelin, Genève, Switzerland. Fumarolic activity observed in late April from the crater area resulted from normal condensation of steam and was not caused by eruptive activity. Information Contacts: V. Kirianov, IVGG. Summit crater observations were made by SVE team members during an overflight on 24 August. Fumarolic activity was very intense on and around the crater, and a very active fumarole field, with many yellow sulfur deposits, occupied a large area just below the rim on the SW slope. No fresh lava was visible on the surface of the lava plug that filled the summit crater . . . during the January 1991 eruption. Information Contacts: H. Gaudru, SVE, Switzerland. Helicopter observations on 12-13 September revealed only the usual fumarolic activity, which was continuing through 6 November. Seismicity also remained at background levels of ~2-3 earthquakes/day through 28 October, except for an increase to ~8-10 earthquakes/day at depths of 1-2 km during the week of 14-21 October. Seismicity was at background levels from mid-December into early January. During 4-6 January, a slight increase in seismic activity (16 events) was recorded at the volcano, but seismicity had returned to background levels (2-3 events/day) by mid-month. Seismicity was again above background in late January through mid-February. Strong fumarolic activity continued from the summit lava flow in the central crater. Similar activity was noted in May 1992, and in April, August, September, and October 1993. 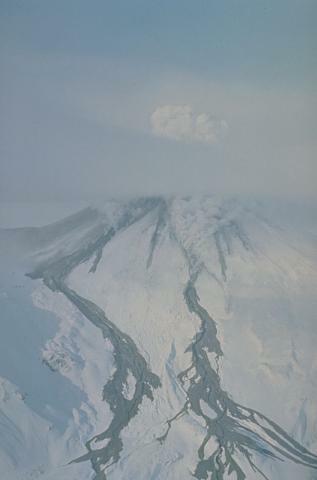 On 7 March the Institute of Volcanic Geology and Geochemistry (IVGG) reported a noteworthy increase in seismicity beneath Avachinsky and an increase in the height of the steam plume to ~100 m above the volcano. The steam plume suggested a possible increase in heat flux. The IVGG reported that the possibility of an eruption within the next few weeks to months has increased significantly. Elevated seismicity was previously reported in late 1993 and early 1994 (BGVN 19:01). Information Contacts: Tom Miller, Alaska Volcano Observatory (URL: https://www.avo.alaska.edu/); Vladimir Kirianov, Institute of Volcanic Geology and Geochemistry, Piip Ave. 9, Petropavlovsk-Kamchatsky, 683006, Russia. Seismicity remained slightly above or at normal levels in June and the first half of July. Normal fumarolic activity was seen above the crater. Regular reports from KVERT (via AVO) resumed in June after funding problems in Russia halted communications in December 1994 (BGVN 19:11). Information Contacts: Tom Miller, Alaska Volcano Observatory (AVO); Vladimir Kirianov, Kamchatka Volcanic Eruptions Response Team (KVERT), Institute of Volcanic Geology and Geochemistry, Russia. Seismicity was about at background level during September, October, and November. Normal fumarolic emissions were observed above the crater. Seismicity continued at normal background levels during November 1996-December 1997. On 22 December, a fumarolic plume rose ~200 m above the crater. Information Contacts: Vladimir Kirianov, Kamchatka Volcanic Eruptions Response Team (KVERT), Institute of Volcanic Geology and Geochemistry, Russia; Tom Miller, Alaska Volcano Observatory (AVO). A distinct change in seismic activity began on 3 December. About 120 shallow events of very low magnitude were recorded during 3-6 December. The only days during the episode when observation was not obscured by cloud were 1 and 3-6 December, but no plumes were seen those days. Seismic activity increased at Avachinsky during early December 1998 (BGVN 23:11). After that, seismicity stayed mostly at background levels until 25 August 2001, when it increased slightly, and was variable through at least October. On 31 August, three earthquakes were registered, M 1.7, 2.2, and 2.6. On 20 September an M 1.7 earthquake occurred. On 21 September from 1705 until 1721, a series of earthquakes within the volcano's edifice was recorded, including an M 2.5 event at a depth of ~4 km. On 22 September at 0500 UTC, a 3-pixel thermal anomaly was clearly seen in an AVHRR image of Avachinsky. At 0750 on 5 October, with an accompanying M 1.5 earthquake, a small explosion lofted ash to less than 1 km above the crater with minor ash falling on the SE flank. Around 19 October a series of weak local earthquakes (~ 50 events of M 0.5-1.5) was registered within 24 hours in the edifice at a depth of ~700 m beneath the summit. Weak fumarolic activity was observed during 20, 23, 26, and 28 September, and 2-4, 10, 11, 16, and 17 October. In contrast, on 6 October fumarolic activity was observed over the entire crater. Small mudflows down the SE flank were visible in late September after every snowfall, presumably due to strong thermal activity of a fumarole on the SE crater rim. Gas-and-steam plumes were observed several times during September and October 2001 (figure 2 and table 1) when clouds did not obscure the volcano. Figure 2. Avachinsky (summit elevation, 2,741 m) and Koryaksky (3,456 m) stratovolcanoes as seen from the city of Petropavlovsk on 13 October 2001. They reside 35-40 km NE of the city and their summits are separated by 12 km. A white plume is extending E from Avachinsky. Courtesy of KVERT. Table 1. Gas-and-steam plumes reported at Avachinsky during September and October 2001. Courtesy KVERT. 19 Sep 2001 -- 30 m above crater. 06 Oct 2001 1250 Low over crater, extending 10 km SE. 07 Oct 2001 0850 Rising 50 m over the crater and extending SSE. 07 Oct 2001 1700 Rising 200 m above crater. 09 Oct 2001 -- Rising low above crater, extending 5 km E.
11 Oct 2001 0940 Rising 200 m and extending 5 km E.
12 Oct 2001 2000 Rising over the crater and extending 1 km E.
13 Oct 2001 1130 Extending 10 km E.
13 Oct 2001 2000 Extending 10 km E.
20 Oct 2001 1430-1930 Rising ~1 km above the crater; extending 20 km SE. 21-22 Oct 2001 -- Rising 50-200 m above the crater and extending SE, E, and NE. A band-6 satellite image on 2 October showed a broad area of warm ground that appeared to follow the rim of the crater, with a small area in the center of the crater. Band-7 data on 2 October showed hotter areas in the SE and SW parts of the crater, and possibly on the N side. On 5 October, the Concern Color Code was increased from Green (volcano is dormant; normal seismicity and fumarolic activity) to Yellow (volcano is restless; eruption may occur). A large, elongate cloud was recorded extending to the SE from the volcano at 1830 on 8 October. The last explosive eruption at Avachinsky occurred in 1991 and lasted 6 days. The eruption began with two ash explosions directed SW toward Petropavlovsk, and covered the town with an ash layer a few millimeters thick. Effusion of lava began 28 hours later. Further explosive activity occurred simultaneously with the lava emission. As a result of the eruption, a lava plug filled the entire crater. 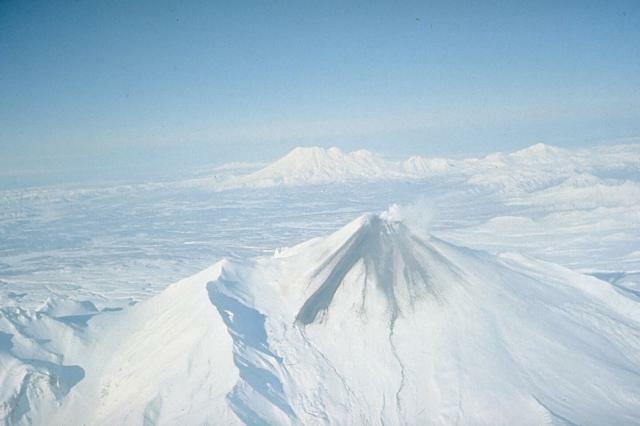 The Kamchatka Volcanic Eruptions Response Team (KVERT) speculated that the recent activity at Avachinsky could indicate the occurrence of a scenario similar to the eruptions in the years 1737 and 1827. Present activity could lead to a large eruption accompanied by directed blasts with voluminous tephra, debris avalanches, and mudflows. Or, gradual damage of the plug might occur by various means, including earthquakes, small explosive discharges, mudflows, etc. Both scenarios could pose a potential hazard to nearby farm cottages (dachas), the Radyugina settlement, and Petropavlovsk-Kamchatsky city. Information Contacts: Olga Girina and Lilia Bazanov, Kamchatka Volcanic Eruptions Response Team (KVERT), Institute of Volcanic Geology and Geochemistry, Piip Ave. 9, Petropavlovsk-Kamchatsky, 683006, Russia; John C. Eichelberger and Tom Murray, Alaska Volcano Observatory (AVO), a cooperative program of a) U.S. Geological Survey, 4200 University Drive, Anchorage, AK 99508-4667, USA (URL: http://www.avo.alaska. edu/), b) Geophysical Institute, University of Alaska, PO Box 757320, Fairbanks, AK 99775-7320, USA, and c) Alaska Division of Geological & Geophysical Surveys, 794 University Ave., Suite 200, Fairbanks, AK 99709, USA. 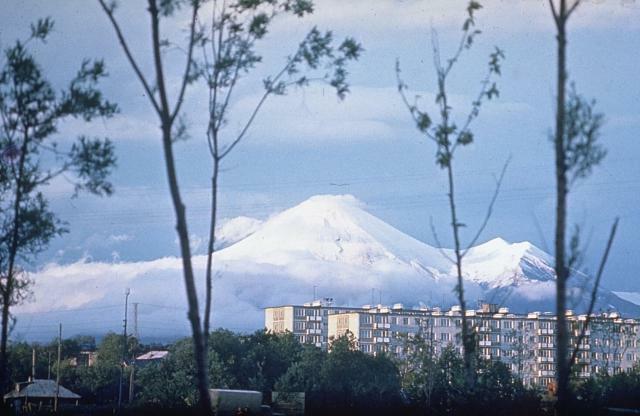 Avachinsky, one of Kamchatka's most active volcanoes, rises above Petropavlovsk, Kamchatka's largest city. It began to form during the middle or late Pleistocene, and is flanked to the SE by the parasitic volcano Kozelsky, which has a large crater breached to the NE. A large horseshoe-shaped caldera, breached to the SW, was created when a major debris avalanche about 30,000-40,000 years ago buried an area of about 500 km2 to the south underlying the city of Petropavlovsk. Reconstruction of the volcano took place in two stages, the first of which began about 18,000 years before present (BP), and the second 7000 years BP. Most eruptive products have been explosive, with pyroclastic flows and hot lahars being directed primarily to the SW by the breached caldera, although relatively short lava flows have been emitted. The frequent historical eruptions have been similar in style and magnitude to previous Holocene eruptions. Braitseva O A, Bazanova L I, Melekestsev I V, Sulerzhitskiy L D, 1998. Large Holocene eruptions of Avacha volcano, Kamchatka (7250- 3700 years B. P.). Volc Seism, 20:1-27 (English translation). Melekestsev I V, Braitseva O A, Dvigalo V N, Bazanova L I, 1994. Historical eruptions of Avacha volcano, Kamchatka: Attempt of modern interpretation and classification for long-term prediction of the types and parameters of future eruptions. Part 1 (1737-1909). Volc Seism, 15: 649-666 (English translation). Melekestsev I V, Braitseva O A, Dvigalo V N, Bazanova L I, 1994. Historical eruptions of Avacha volcano, Kamchatka: Attempt of modern interpretation and classification for long-term prediction of the types and parameters of future eruptions. Part 2 (1926-1991). Volc Seism, 16: 93-114 (English translation). Melekestsev I V, Braitseva O A, Ponomareva V V, 1989. Prediction of volcanic hazards on the basis of the study of dynamics of volcanic activity, Kamchatka. In: Latter J H (ed), Volcanic Hazards - Assessment and Monitoring, Berlin: Springer-Verlag, p 10-35. Melekestsev I V, Kiryanov V Y, 1984. When will Avacha volcano in Kamchatka erupt?. Volc Seism, 1984(6): 107-110 (English translation 1988, 6: 943-951). Melekestsev I V, Sulerzhitskiy L D, Bazanova L I, Braitseva O A, Florenskaya N I, 1995. Holocene catastrophic lahars at Avacha and Koriakskiy volcanoes in Kamchatka. Volc Seism, 17: 561-570 (English translation). There is data available for 58 Holocene eruptive periods. There is no Deformation History data available for Avachinsky. There is no Emissions History data available for Avachinsky. 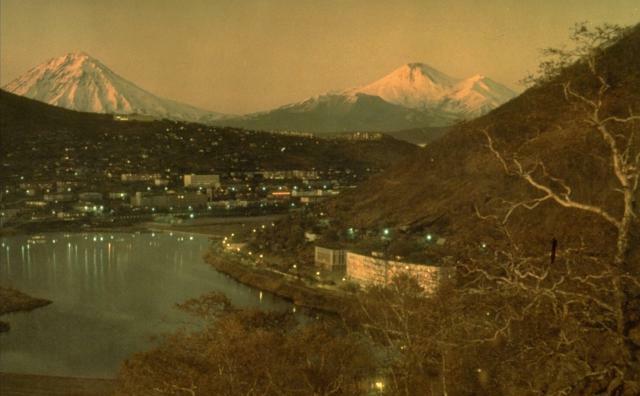 The setting sun illuminates the slopes of Koryaksky (left) and Avachinsky (right) volcanoes at dusk as the lights of the city of Petropavlovsk are reflected in Avachinsky bay. The two historically active volcanoes form prominent landmarks north of Kamchatka's largest city. Photo by Kamchatka Volcanic Eruptions Response Team (courtesy of Dan Miller, U.S. Geological Survey). An ash column rises above the summit crater of Avachinsky volcano on January 16, 1991. 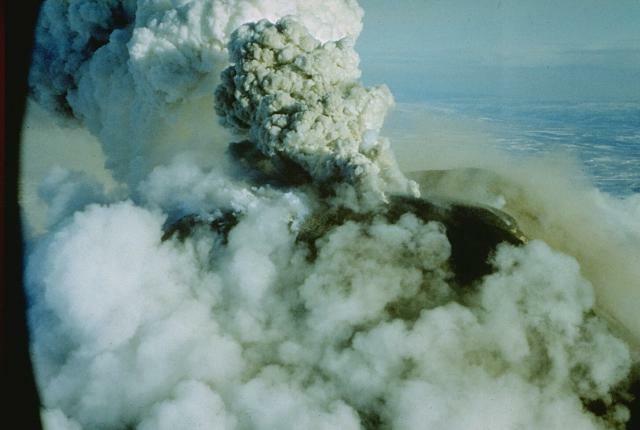 Explosive eruptions beginning on January 13, 1991, ejected ash clouds 4-5 km above the crater and produced ashfall on Petropavlovsk. During the course of the eruption, lava filled the 260-m-wide summit crater and formed a low, 400-500 m wide lava dome. Small lava flows spilled over the crater rim and advanced 1.5 km down the SSE flank and a short distance down the SW flank. Melting of snow by the lava flows produced small mudflows down the south flank. Photo by Oleg Volynets, 1991 (Institute of Volcanology, Petropavlovsk). 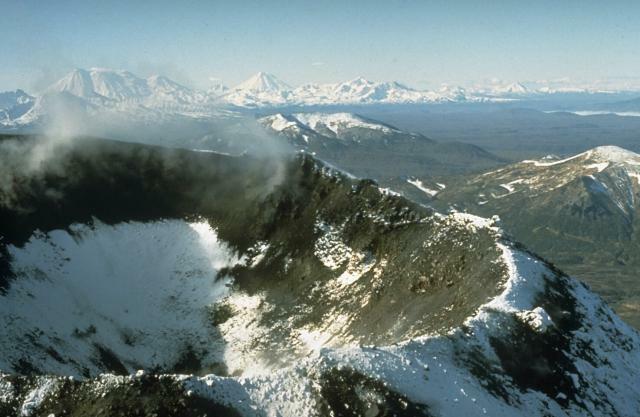 During an eruption in January 1991, a lava dome filled the summit crater of Avachinsky and produced these dark lava flows that spilled over the south rim and traveled 1.5 km down the SSE flank. The modern cone of Avachinsky was constructed within a large horseshoe-shaped caldera, whose rims form the prominent ridge at the right and the more subdued ridge at the left. The breached caldera was formed by collapse of the volcano during the Pleistocene. The complex Zhupanovsky stratovolcano forms the center horizon to the NE. A flat-topped blocky lava dome that formed during a January 13-30, 1991 eruption fills the summit crater of Avachinsky in this spring 1991 aerial photo from the south. Prior to the eruption, the 400-500 m wide crater was about 250-m deep. The snow-covered shoulder at the upper right is the rim of the 4-km-wide horseshoe-shaped caldera inside which the modern Avachinsky volcano was constructed during the late Pleistocene and Holocene. Photo by V.N. Nechaev, 1991 (courtesy of Oleg Volynets, Institute of Volcanology, Petropavlovsk). Steaming lava flows descending the SSE and SW flanks of Avachinsky volcano in January 1991 melted snow and formed dark-colored mudflows that traveled farther down the volcano's flanks, forming the braided channels at the bottom of the photo. A light-colored eruption plume rises above clouds obscuring the summit crater. 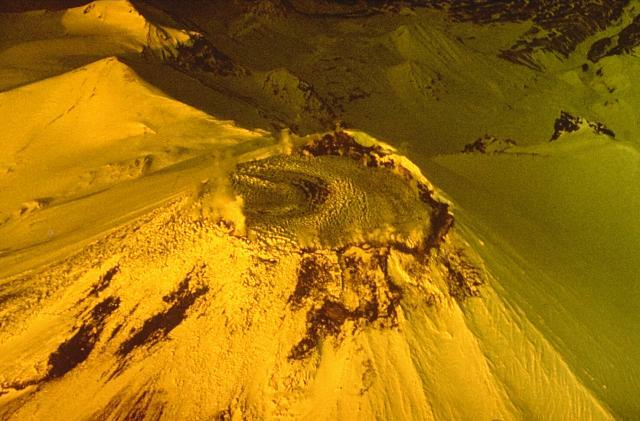 The 1991 eruption began with explosive eruptions on January 13 and ended on the 30th. The smooth-sided, symmetrical central cone of Avachinsky volcano was constructed during the late Pleistocene and Holocene within a horseshoe-shaped caldera left by a late-Pleistocene collapse of an earlier edifice. The steep-sided, 250-m-deep summit crater seen steaming in this view was completely filled by a lava dome during an eruption in 1991. Prior to the 1991 eruption, the summit of Avachinsky volcano contained this steep-walled crater that was about 250-m deep. Extrusion of lava flows during the January 1991 eruption produced a flat-topped lava dome that filled the crater. Lava flows spilled over the rim of the crater and traveled down the SSE and SW flanks. This October 1991 photo looks NW across a steaming lava dome that was extruded in the summit crater of Avachinsky during an eruption in January 1991. Explosive eruptions beginning on January 13 ejected ash clouds to 4-5 km above the crater and lava was emplaced on its floor. By the time the eruption ended on January 30, the 400-500 m wide, 250-m-deep crater was filled with lava to its rim. Lava spilled over the southern rim of the crater, feeding lava flows that traveled 1.5 km down the SSE flank and short distances down the SW flank. Photo by A. Obsyannikov, 1991 (Institute of Volcanic Geology and Geochemistry, Petropavlovsk). Avachinsky, one of Kamchatka's most active volcanoes, rises above Petropavlovsk, Kamchatka's largest city. The shoulder at the right is the rim of a large horseshoe-shaped caldera, breached to the SW, that was formed about 30,000-40,000 years ago when a major debris avalanche buried an area of about 500 sq km to the south underlying the city of Petropavlovsk. 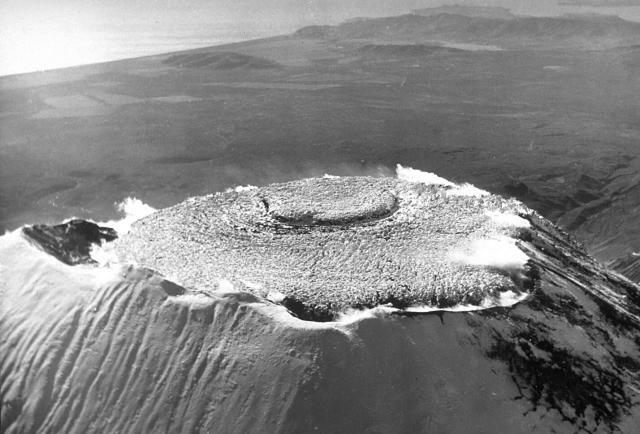 Construction of the modern, 2741-m-high cone inside the breached caldera followed. Frequent historical eruptions have been recorded since 1737. Photo by Oleg Volynets, 1985 (Institute of Volcanology, Petropavlovsk). A 200-250 m wide crater occupied the summit of Karymsky volcano following a long-term eruption during 1970-82. This early 1990's photo looks into the crater from the NE. Several other prominent central Kamchatka volcanoes form the snow-capped alignment of volcanoes in the background. Zhupanovsky volcano, at the extreme left, is composed of four overlapping stratovolcanoes constructed along an WNW-ESE line. Sharp-peaked Koryaksky volcano is at the left center, and the broad Dzensursky massif to its right. The Avachinskaya volcano group consists of a NW-SE-trending chain of stratovolcanoes north of Petropavlovsk. Seen here from the western outskirts of the city, 3456-m-high Koryaksky volcano is on the left, 2741-m-high Avachinsky at the right center, and 2189-m Kozhel volcano at the extreme right. Koryaksky has had only a few minor eruptions during historical time, but Avachinsky is one of Kamchatka's most active volcanoes. 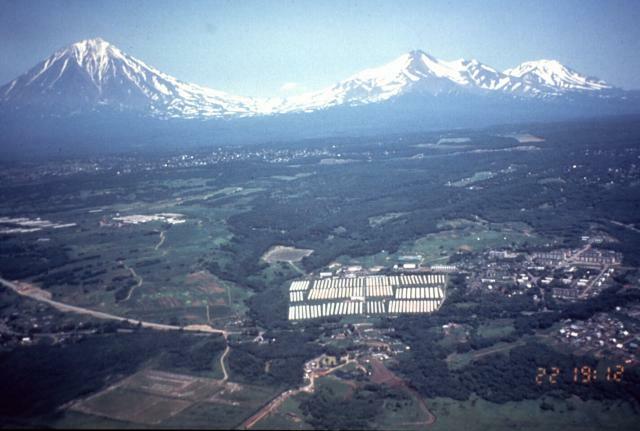 Photo by Vera Ponomareva, 1996 (Institute of Volcanic Geology and Geochemistry, Petropavlovsk). Large Eruptions of Avachinsky Information about large Quaternary eruptions (VEI >= 4) is cataloged in the Large Magnitude Explosive Volcanic Eruptions (LaMEVE) database of the Volcano Global Risk Identification and Analysis Project (VOGRIPA).